I decorated these frames about a year ago. All but the pink frame were purchased at Michael's craft store for $1 each; the pink frame is sold through Ikea (I think $2 each), but I purchased a set of 10 at a yard sale for $1. All the paint was purchased at Michael's. I like the buy the 2/$1 paints of the $1-1.29 ones. For this frame, I painted two coats of pink paint. While that was drying, I used a hole punch to punch holes through two pages in a catalog. One page had a bubblegum pink background, the other a bright green. Once the paint was dry, I painted Modge Podge on the frame in sections, setting the polka dots down on the tacky surface. Watered down school glue would work similarly. I used this same process to decorate the purple polka dot frame. For this frame, I started by painting the entire frame light pink. While it was drying, I cut out images of the Hope Gardens print from a Vera Bradley catalog. You could use similar prints from any sort of catalog or magazine (catalogs selling bedding, window treatments, and clothing work really well). I painted Modge Podge onto the frame, sticking down the images I had cut from the catalog. Once all the images were attached, I used an exacto knife to trim the excess from the inside and scissors to trim the excess from the outside of the frame. Then I painted an additional coat of Modge Podge to give it some sheen. For the ladybug frame, I used a technique my friend Amy had used on two frames she gifted to me at my housewarming party. Personally, I like how Amy did the frames she made better - next time I'd used wider stripes like she did and LESS Modge Podge because I put way too many coats on this. I started by painted the frame green, which was pretty much unnecessary. While it dried, I went through a number of catalogs and magazines, cutting out strips of green material. All the horse catalogs I get really came in handy for this - who knew there were so many shades of grass? I attached the strips using Modge Podge, then once they were dry I hot glued a bunch of little ladybugs (and one big ladybug) around the frame. For the silvery-purple frame, I started with a purple base, then lightly painted silver overtop while the purple was still wet. Once that dried, I glue on a small bird and a birdhouse. I purchased all the little wooden critters at Michael's for .25 cents each. These are the adorable frames Amy made (I stole this picture from her). 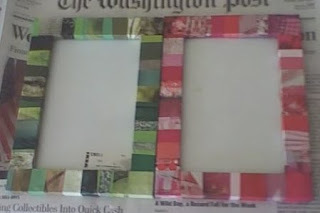 I love decorating picture frames because it is such a cheap craft. It's a lot of fun to make these with kids (I've decorated tons of frames with the kids I babysit) or with friends. And if you mess up, the frames are only $1, so you can always get more! What an awesome craft idea!! I've done this before as an activity in college. I got cheap frames and made it into an activity at the dorms (I was a resident assistant). I got little things they could stick on too like 3D charms of planes and ribbons and bones. OMG Brooke I haven't heard "Modge Podge" in a billion years. My mom used to be a very crafty person. I betcha know about Aliene's (sp?) Fabric Glue too, right?!? they are super duper cute, BTW! These frames are amazing, maybe you will make some for me? ^^ Just kidding, but they're really awesome! Very cute frames! I haven't worked with Modge Podge in years. And they are all kittehs!!! ;) Dang cute! Brooke, these are too cute! I've often been tempted whenever I stop by Ikea to pick up those frames to paint them, but the laziness within me always gets in the way of that fun project! Kudos to you and your super cute frames!! Love these frames you decorated. It's cool when people put their personal stamp on things they make themselves. I especially liked the idea of you using magazine pages to create the stripes instead of buying paper - very eco-friendly chic! I've got a bunch of boring wooden frames that I've been meaning to do something with for a long time. Thanks for giving me some great ideas!